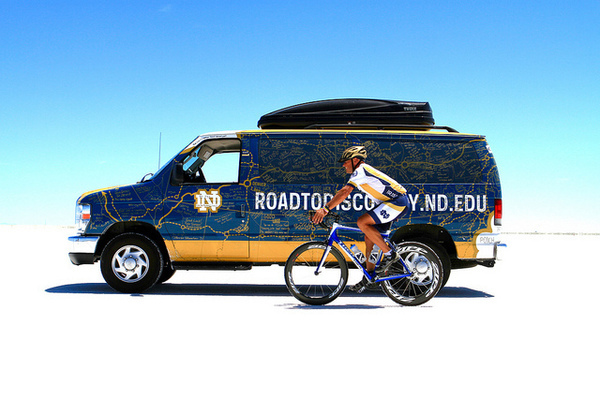 Join the College of Science and Notre Dame Club of St. Joseph Valley in welcoming the Road to Discovery to Notre Dame! All Notre Dame faculty, staff, students, and alumni are invited to attend. Enjoy hors d’oeuvres and refreshments with the Notre Dame family and learn about this cross-country bike ride and Notre Dame’s role in fighting Niemann-Pick Type C (NPC) from Greg Crawford, dean of the College of Science, Coach Ara Parseghian, and Cindy Parseghian, president of the Ara Parseghian Medical Research Foundation. Be sure to bid on great silent auction items, including signed Coach Ara Parseghian memorabilia. All silent auction proceeds will benefit rare disease research at Notre Dame.